The following is a graph made by me using data I got from the federal vital statistics site. I merged the two data together. Very self explanatory. Now, don't get me wrong. I am only posting this for us to think about. The reason we shouldn't use this data as a definitive "proof" of the deterent concept is the same reason why we shouldn't use the ice cream sale in comparason to crime rate in the summer. However, the fact that this data was taken over a period of 50 years should be enough to indicate that it is too good to be a coincidence. As to whether I support CP or not is still a toss up. I really don't know which way to lean because both arguments have their strengths and weaknesses. If you don't see a downside, I feel sorry for you. As for justice, well reparation is a good start. In legalese 'Making good'. As for Court TV, you are advocating the system being televised, what I was suggesting was the end result being televised. We could even dispense with the trial bit and round up the usual suspects and the one who performs (televisually) the best will be innocent. capital punishment is an act of frugality. the real reason it's around is because it's cheaper. A couple years back, I was involved with a project for an ethics class about history of capital punishment and the current situation. I do not have the sources with me right now, but you can take my word for it that it costs about 2 million dollars more per person to go with the execution than life imprisonment. That is one hell of a graph!! I do have a few problems with it. Could we put a few other statistics on there as well. Economic growth rate. Gap between top 20% and bottom 20% economically. General crime rate. 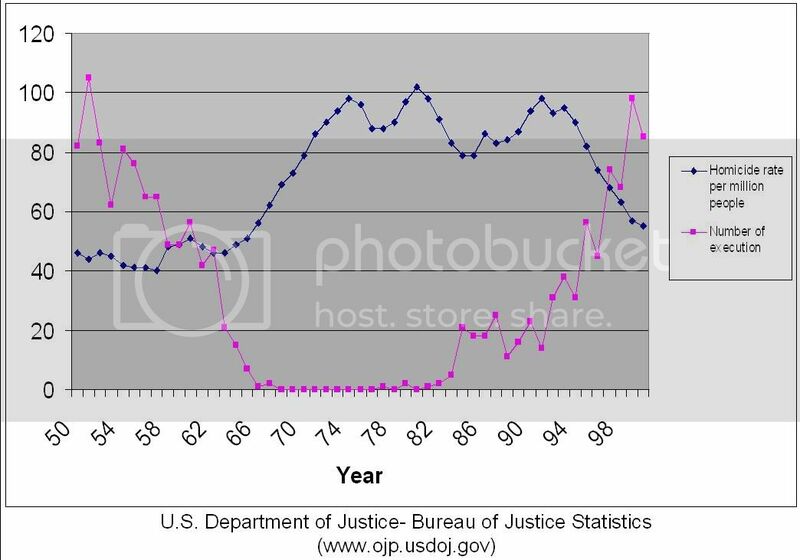 Capital crime as a proportion of crime rate. Price of oil. Price of a colour TV. As a statistician in a former life I can see that the the graph is supposed to be incendiary and I will dismiss it as such. Perhaps if I saw lag times leading to a general overall fall in capital crimes or that the vertical axis reflected accurately the same proportions. Absolute numbers and nos. per million on the same axis, shame on you! As a statistician in a former life I can see that the the graph is supposed to be incendiary and I will dismiss it as such. It wasn't meant as anything. I do admit that at the time, I set out to show that CP was not a good method for deterant. You can call me a liar if you wish, but I honestly did not intend to make the graph incendiary. I simply plotted the two data on the same graph. Perhaps if I saw lag times leading to a general overall fall in capital crimes or that the vertical axis reflected accurately the same proportions. You really think I'm stupid? Look again at what you are asking for. Absolute numbers and nos. per million on the same axis, shame on you! It'd be hard to show number of executions in the millions, don't you think? But anyway, here are some more graphs. These ones were from another project. I am not a statitician by any mean. I can only interpret these graphs based on my very limited knowledge of statistics. By the way, you really need to read people's posts more carefully. You saw the graph and you automatically assumed that I'm a pro-CP person without reading a single word I wrote. graphs mean nothing. you might as well look at crosstabs. insert the data, run a regression, difference of means, etc. on top of that. you'll have to look at intervening factors such as crime prevention spending, educational success, general feeling of quality of life, and so forth. but then i'm just a poli sci major. it's not what i will prolly do for a living or anything. ask pink sas. prolly knows better than i.
I did not assume diddly squat - I just accused use of wilful misuse of numbers. Graphs!! More graphs!!! I am beaten into a corner with visual depictions of reality - help me!!! What do the greyed out parts of the graph mean? What does adjusted mean in adjusted figure? As an example graph 2 - does this indicate that 3/5 of all households in the mid-70s were victimised each year? Wow - were you ever in trouble. You obviously are a great place to be now, only 1 in 5 properties are victimised every year. Graph 3 - violent crime isn't recorded crime - is it hearsay crime? Anyway - time for bed - but a quick note - the stats in the graphs, what are the criteria, what is the data collection method, who asked the questions, who answered them? - I only ask because I would never, ever use a graph unless I had compiled the data myself, and my intention was never to call you a liar, a proponent of anything, other than random drive-by graphics. the stats in the graphs, what are the criteria, what is the data collection method, who asked the questions, who answered them? I only ask because I would never, ever use a graph unless I had compiled the data myself, and my intention was never to call you a liar, a proponent of anything, other than random drive-by graphics. Which indicate to me that you didn't really read my posts. Take a deep breath and read them again. Heck, a website was even provided on one of the graphs and you somehow missed it. I have treated this conversation more seriously than you have. So far, you have only waved your hands at my posts and continued to acuse me of several things, including lying. Are you going to start treating me seriously or not? Do you even know where I stand on the issue? Before you answer, take a deep breath and say 10 prayers of hail mary. Then, pray to Pat Robertson, Jimmy Swaggart, and Jerry Falwell. Then, reply with a little more seriousness. Thread copied to the Death Penalty and Stanley Tookie Williams thread in the Coffee House forum, this copy of the thread has been closed.